Toast the bread until golden brown and crunchy. Cut each slice into 3 to 4 pieces. Set aside. Cut the avocado in half, lengthwise. Remove the pit. Use a spoon to scoop out the flesh. Discard the pit and the skin. Place the avocado flesh in a bowl. Mash the avocado coarsely with a fork. Mix in the lemon juice and the lemon pepper seasoning. Set aside. Spread cream cheese all the way to the edges of the toast. Spread the avocado mixture over the cream cheese. 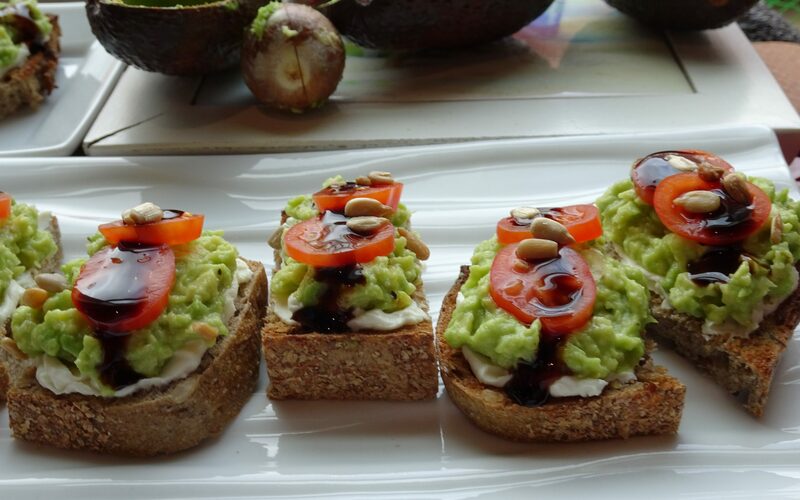 Place 2 to 3 cherry tomato slices over the avocado. Drizzle a line of balsamic glaze over the tomatoes. Garnish with a light sprinkling of sunflower seeds. The Cooking Ladies’ 10th cookbook, “On the Road with The Cooking Ladies, Let’s Get Grilling”, is available on Amazon at http://amzn.to/2CjLfR0 and wherever books are sold.